Image © DC Comics. Written by Joshua Williamson, art by Rafa Sandoval & Jordi Tarragona, colors by Tomeu Morey & Hi-Fi, letters by Steve Wands. Part 3 of “Force Quest” has Barry Allen and Iris West in Corto Maltese trying to speak to a new Strength Force user, Fuerza. Unfortunately, she’s in the middle of a battle with the police. When Barry helps her, she allows him to follow her to her headquarters, and agrees to tell him what she knows about the Strength Force, which came to her a few weeks earlier. 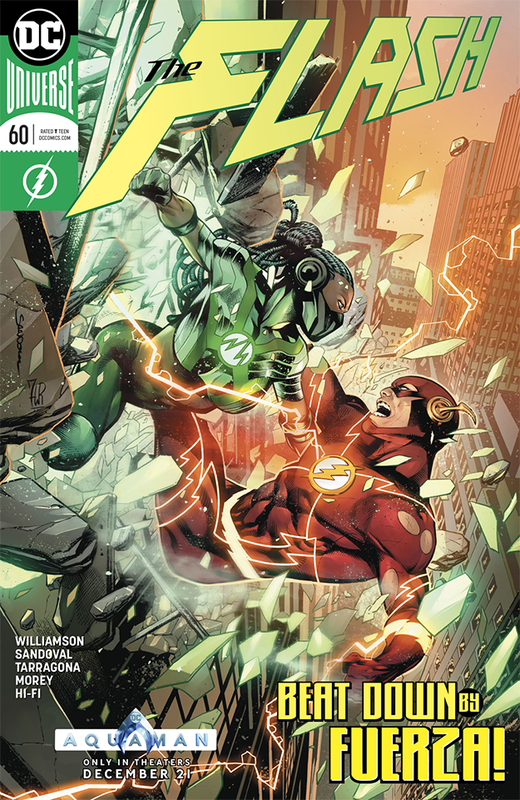 Meanwhile, in Africa, the twin villains Gemini are on a new mission that will intersect with Flash later, and in Central City, Flash’s fill-in, the future Captain Cold, is being played by another of Flash’s Rogues Gallery. The heart of this issue is corruption, as we learn Corto Maltese’s police chief is not only on the take, he’s getting heavy weapons to use against his people as well as superheroes from someone involved with the Sage Force. The one he uses on Fuerza and Flash is most unusual. Not loving this storyline, but it’s reasonably entertaining. Recommended. This entry was posted in Comics, Reviews on February 13, 2019 by Todd.